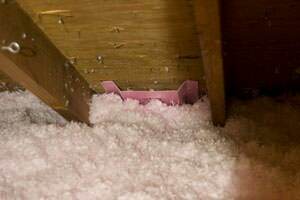 The U.S. Department of Energy recommends between R-49 and R-60 of attic insulation in Sterling, Leesburg, Ashburn, Fairfax, and other areas. That's at least a 16-in.-thick blanket of fiberglass insulation! This homeowner in Reston, VA was experiencing cold drafts in their house so they called us. We were happy to help make their house more comfortable by air sealing, which closes all accessible penetrations using expanding polyurethane foam and then we installed our blown-in cellulose insulation. The results of doing this a warmer in the winter, cooler in the summer, more comfortable, and less drafty house! A customer in Reston, VA called and wanted to make their upstairs more comfortable. They were experience cold drafts and high energy bills. We performed a home energy audit to determine where the drafts were coming from. We used spray foam insulation to seal up the attic and make it more comfortable and energy efficient. 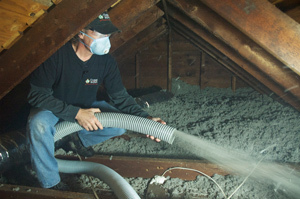 We offer Free Estimates for attic insulation in Ashburn, Reston, Sterling, Reston, Great Falls, Vienna, Herndon, Purcellville, Fredericksburg, Middleburg, and the neighboring locations including Stafford. We also offer a unique system called the SuperAttic™ System, which adds a continuous & airtight layer of foam insulation beneath the attic rafters and inside the attic's gable walls. Air sealing is a critical step when insulating an attic because sealing air leaks stops conditioned interior air from leaking into the attic. Comfenergy uses a variety of materials and techniques to stop this energy-wasting air leakage. Call 1-855-764-5297 or contact us online to schedule a home energy audit or an estimate for home insulation in Reston, Sterling, Ashburn, and in and around Herndon, Reston, Great Falls, Middleburg, Purcellville, Fredericksburg, Vienna, Manassas, and Stafford.